A 5.8-magnitude earthquake hit northern Japan on April 20, just days after the southern area of Kumamoto suffered two large quakes that killed 48 people. The tremor happened northeast of Namie, according to the U.S. Geological Survey (USGS). The depth of the earthquake was 38.5 miles. 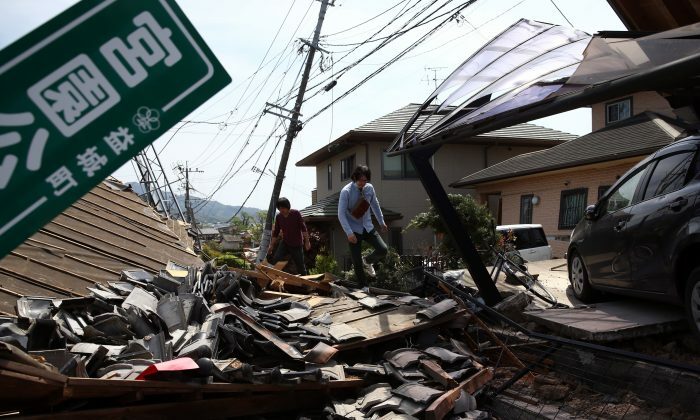 The country has suffered widespread damage after recent earthquakes—the first earthquake measured a magnitude of 6.5, while the second was even stronger with a magnitude of 7.0. The Kumamoto prefecture said 11 people have died from illnesses believed to be linked to the physical stress of evacuation. Three people are still missing. More than 100,000 have been left homeless. Meanwhile in Ecuador, the country suffered a 6.1-magnitude earthquake on April 20, a few days after a 7.8-magnitude earthquake over the weekend. The USGS said the quake’s epicenter was offshore, 15 miles west of the destroyed beach town of Muisne, and occurred at 3:33 a.m. local time (4:33 EDT). The National Prosecutors Office put the death toll at 525 on April 20, 435 of the dead were found in the Manta, Portoviejo, and Pedernales areas. Officials said they expect more bodies to be found—the Defense Department said more than 200 people are still missing; some reports say up to 1,700 people are missing. Officials said at least 11 foreigners died from the quake. The earthquake damaged about 1,500 buildings and left 20,000 people homeless, officials said. The USGS said the country has not suffered an earthquake that big since the 1940s. How Are the Earthquakes in Ecuador and Japan Related? A 6.4 magnitude earthquake hit southern Japan on April 14. There have also been reports of aftershocks.